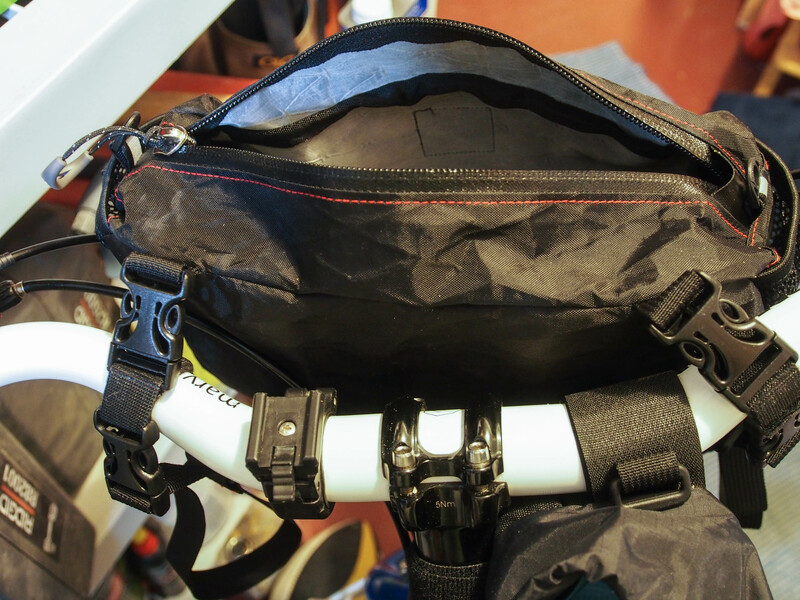 Revelate Designs handlebar pocket with a 10 liter dry bag. 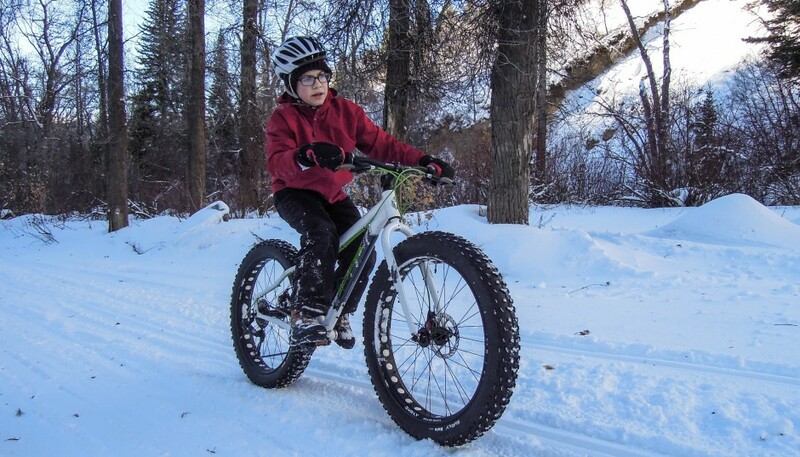 Shortly after getting my fatbike (Surly Pugsley) I began to think about bikepacking. 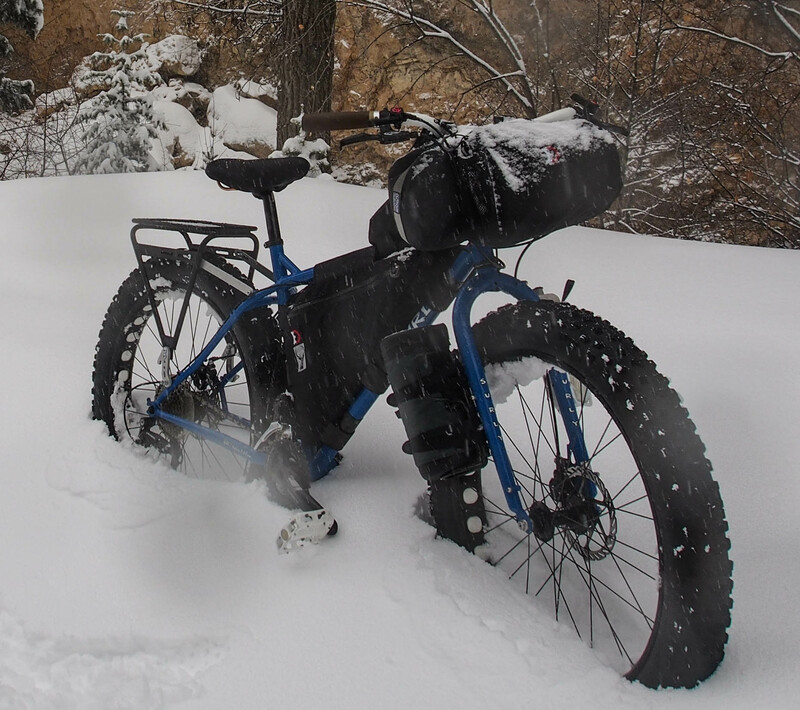 I have been backpacking since I was 11 years old and combining that with bikes is quite appealing to me. 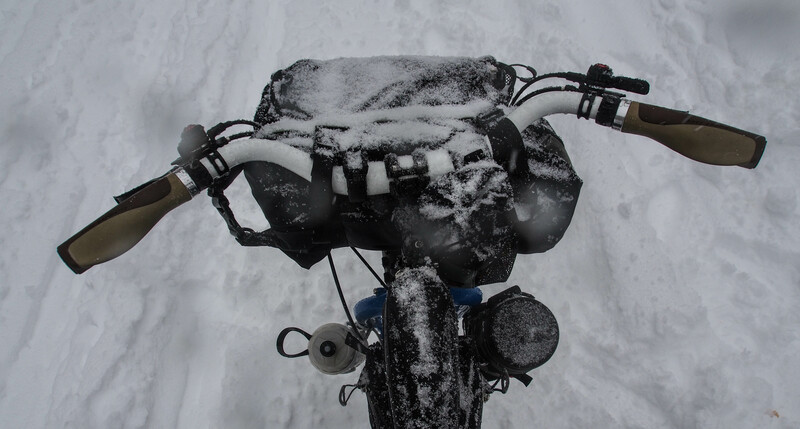 I looked around at all the options for carrying things on your handlebars and began experimenting. I first simply strapped a 12 liter dry bag to my handlebars. It seemed to work just fine. But I also like the idea of having a pocket up front. 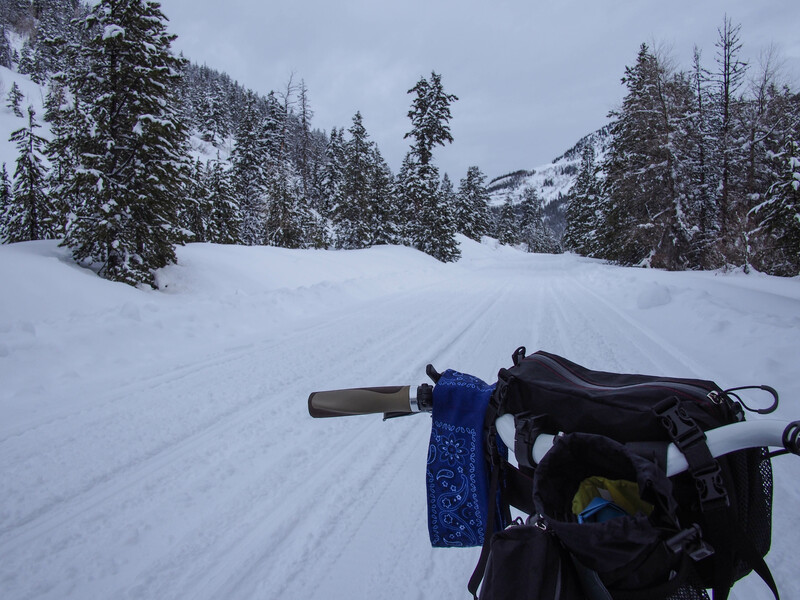 I have been touring on the road for a few years and I really like the quick and convenient access of a handlebar bag. I considered the Revelate Designs Harness or Sweetroll, but they seemed a bit expensive, and with my Mary On One curved bars I was not confident that the Harness would even work. 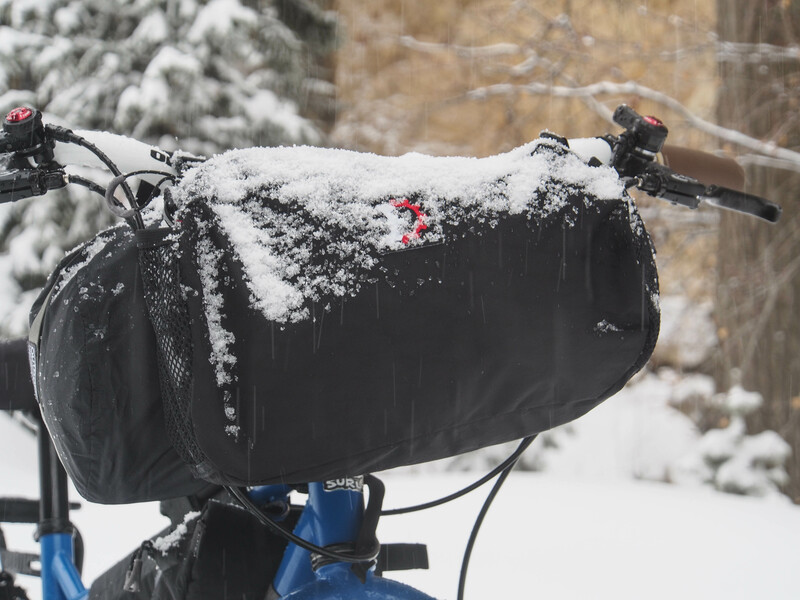 I think I read somewhere that the Revelate Designs front pocket could be used independently as a handlebar bag, or in conjunction with a standard dry bag, so I decided to give it a try. I found it on sale for about $38. 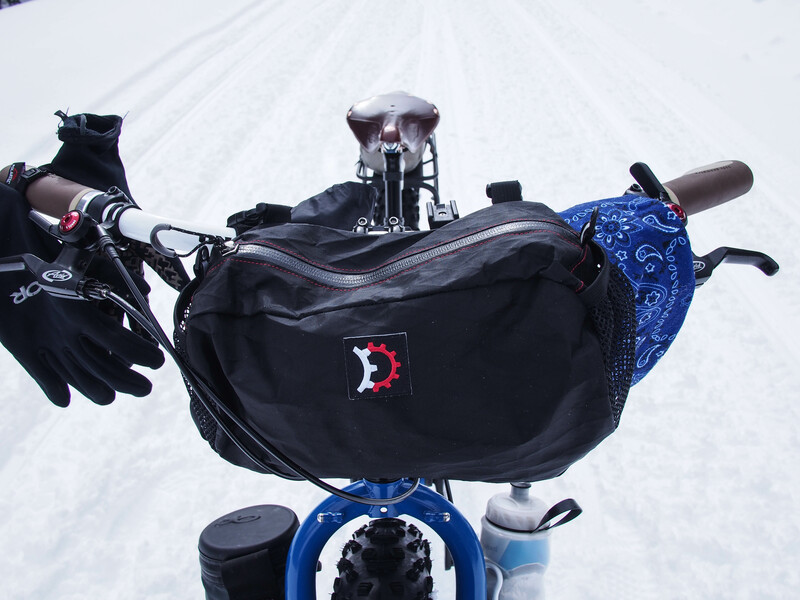 I have used it for day trips both strapped around a dry bag and alone as a handlebar bag with the optional pocket clips that RD sales for only $4.00. This is just a simple velcro strap with a male and female fastex buckle. The pocket then clips to these. 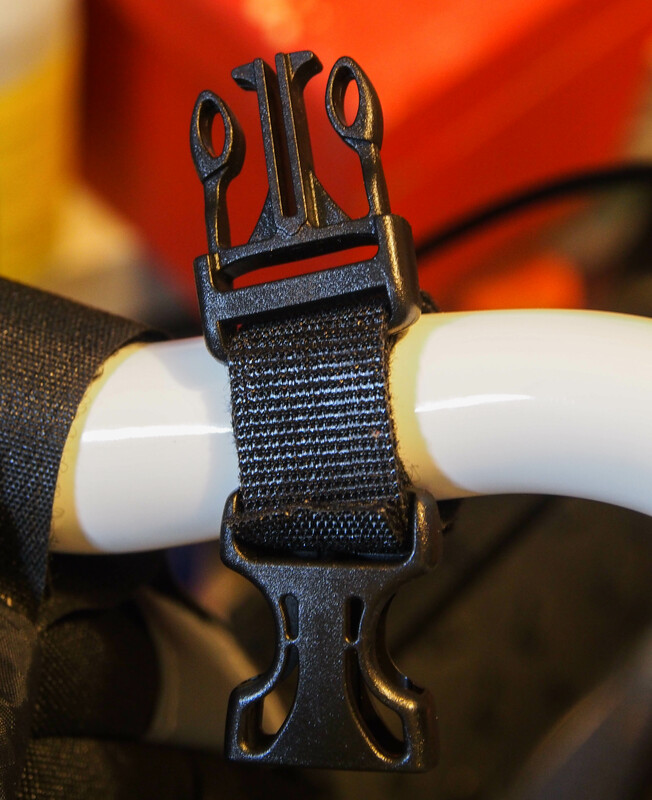 The straps keep the pocket cinched up tight against your handlebars. The RD pocket used alone as a handlebar bag. The pocket (at least the large size one) has a piece of fabric connected to the straps which nicely cradles a dry bag and gives it support and prevents it from sagging too much. The large RD pocket with support fabric on the bottom. 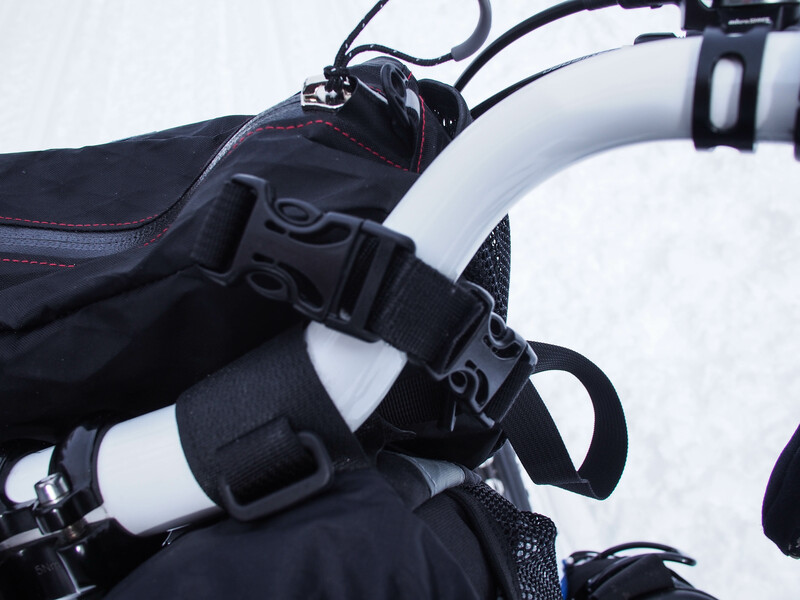 When using the pocket with a dry bag you will not want to use the pocket clips because you want the pocket to wrap around the dry bag and sit at the front of it away from the handlebars. I have tried it with both a 10 and 12 liter dry bag. This size fits very nicely between my curved bars and behind the cables, while the pocket sits on the outside of the cables. In other words, I direct the cables between the dry bag and the pocket. I have the large size pocket which has one large pouch on the inside, with a divider on one side to store flat objects like maps. 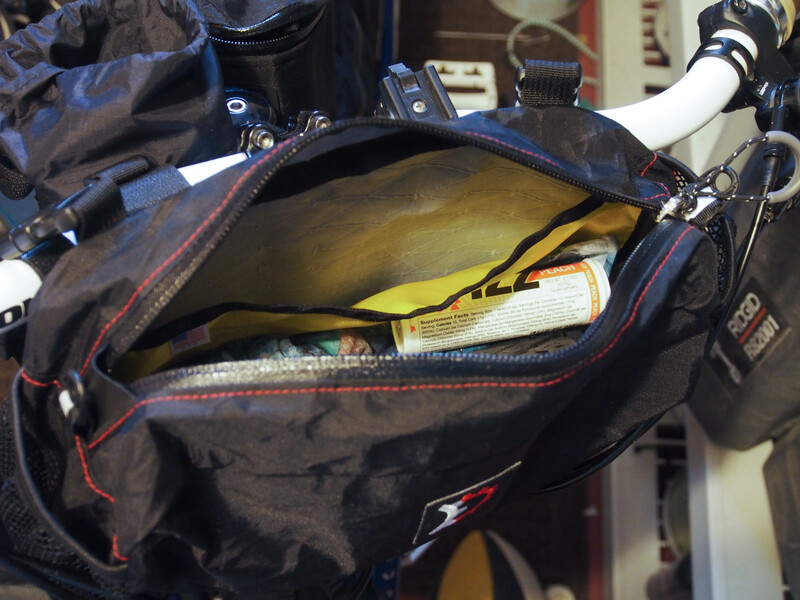 It also has a mesh pocket on each side that are good for storing energy gels, small tools and such. Or, they are good for stuffing your gel and bar wrappers. The pocket is quite large and will fit food, a jacket, extra gloves, hat, camera, and so on. Inside the RD large pocket. Notice the sleeve pocket at the back of the pocket. I have found that both configurations work quite well and with my handlebars don’t seem to need any other support. I have not loaded it up for a multi-day trip yet, but when out riding for several hours at a time, it seems to work well. Here are a few more photos of the pocket in action. With a 10 liter dry bag strapped behind the pocket. Top view with a 10 liter dry bag. 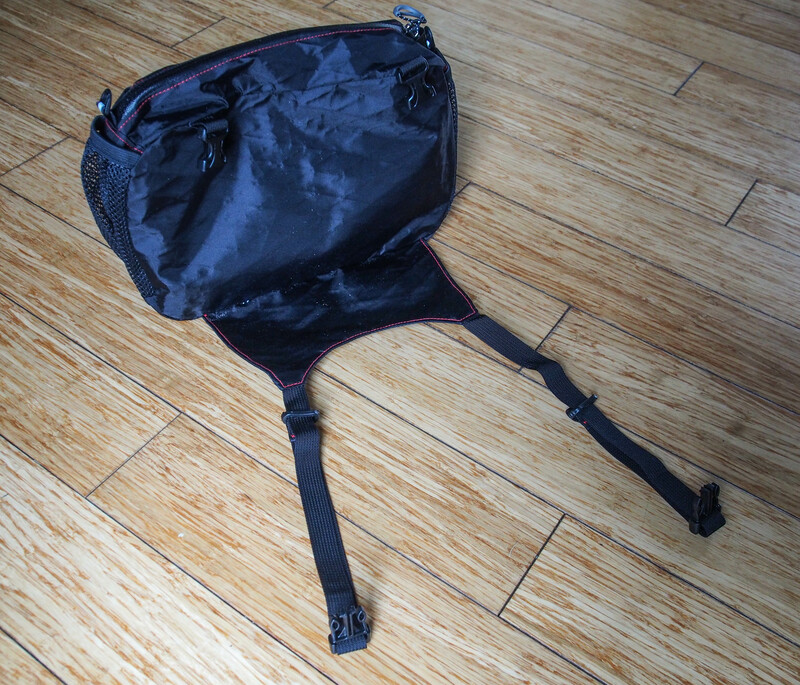 RD pocket as handlebar bag. This shows the pocket clips and how the pocket attaches to the handlebar.